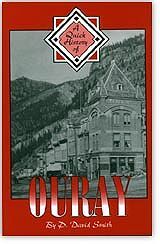 The history of "Ouray - Gem of the Rockies" is a fascinating tale of the typical boom and bust cycles of all of Colorado's major mining towns. Silver brought the first prospectors to the beautiful valley, but gold kept Ouray from becoming a ghost town after the Silver Crash of 1893. The town rebounded due to demand for metal prices during World War I and II but it slipped into an economic depression after each war. Although tourism was always important, in the 1970s it became more vital to the economy, and the town has continued to grow and prosper since that time. The abandoned ghost towns and mining relics that litter the local hillsides can be seen by anyone traveling the jeep trails interlacing the local mountains, which contain some of the most amazing scenery in the world.